Do you often need to take salads, meals, and snacks on the go? 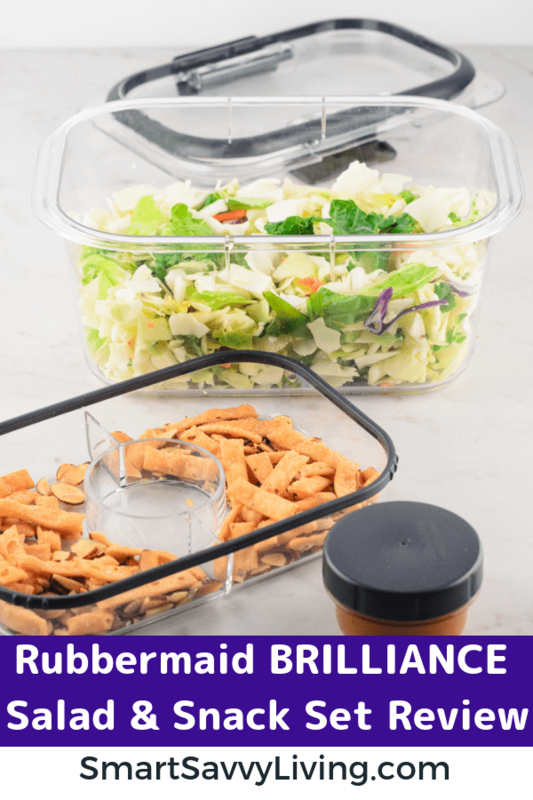 Check out our Rubbermaid BRILLIANCE Salad & Snack Set Review to see if they can help make your life easier. 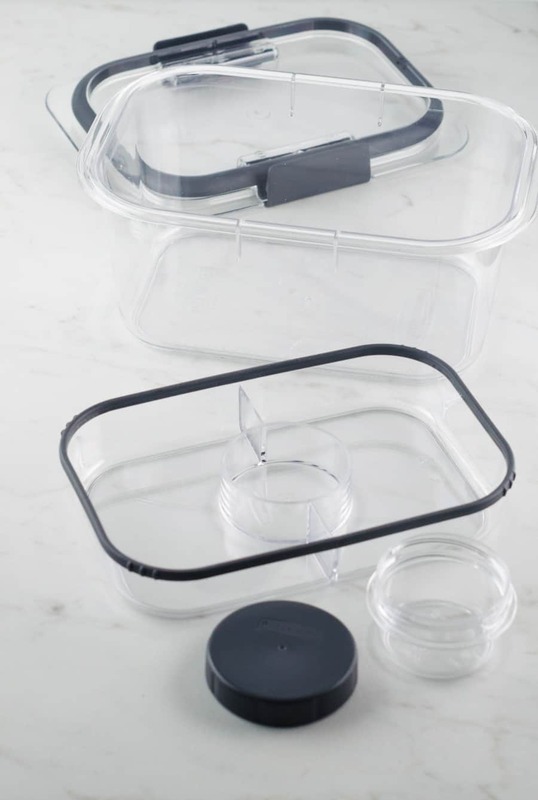 This is a sponsored article written by Smart Savvy Living on behalf of Rubbermaid®. 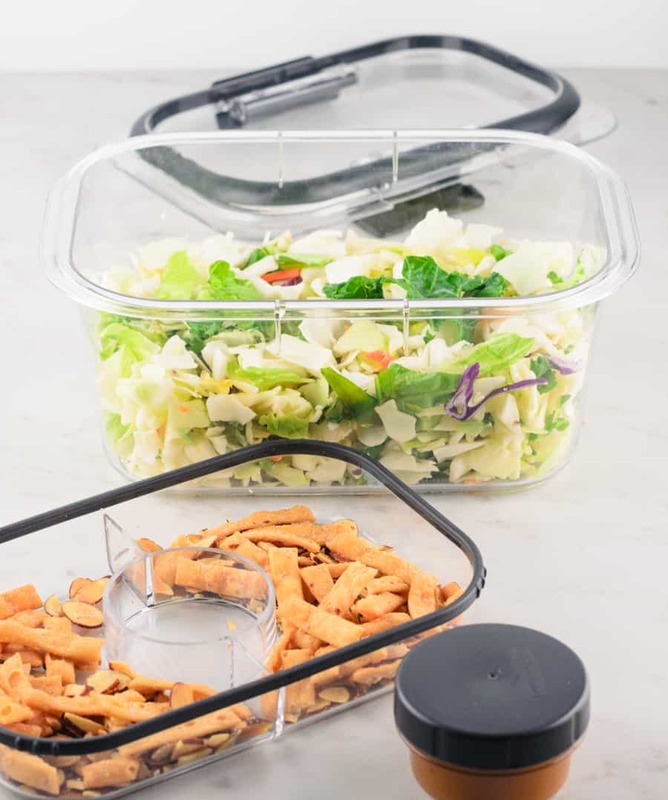 The Rubbermaid BRILLIANCE Salad & Snack Set is touted as Rubbermaid’s 100% leak-proof* storage container perfectly designed for ready-to-go meals and snacks. 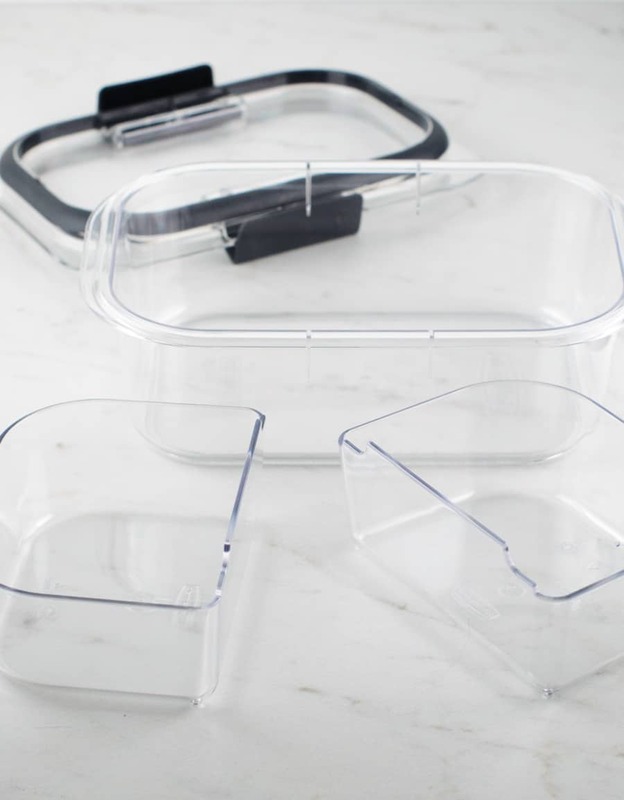 They’re customizable thanks to adjustable insert trays and dividers that you can create separated compartments with. The containers are BPA free and also safe for the dishwasher, microwave, and freezer. They’re also made with an ultra-durable Tritan material. This helps keep the containers both stain and odor-free. From what I’ve seen at online stores, the price for the salad & snack set is around $23. I thought that the dressing cup was too small. I tested putting in the usual size packet of dressing you would get from a restaurant and not all of it would fit. While it’s handy to have 2 compartments for the snack container I kind of wish they were fused together. It’s not difficult to get both in the container but it sometimes takes a bit of jiggling. I’ve been doing this whole adulting thing for more than a couple years now. But, to eat healthy consistently, I need to have good-for-me foods ready to go in an instant. I think this is a thing a lot of adults struggle with. We don’t necessarily mind eating healthier foods but we need something that’s ready to go while we work or have a break. That’s why I’m a big fan of prepping healthy meals and snacks a couple times a week. I store them in food storage containers that stack in the fridge easily so I can just grab and go. I find it especially helpful for healthy snacking and light lunches like salads. Meal prep containers can be super simple. But, I think there are a few qualities that the Rubbermaid BRILLIANCE line has that makes them really stand out from the rest. First, the containers themselves are leak-proof*. They have snap-on lids and a tight seal. So, even if you drop them or have them tumble across your car at a sudden stop they shouldn’t leak. Next, I really like that there are customizable compartments in the containers. I honestly don’t mind when my food touches or is even mixed together. 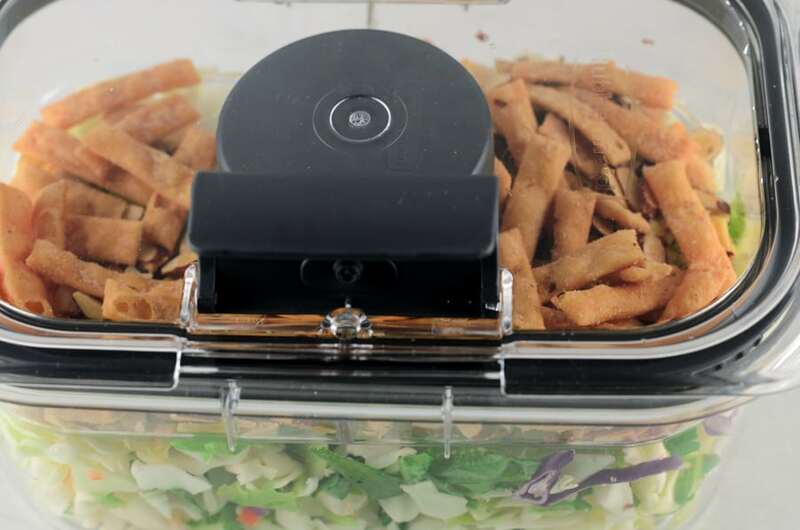 But, you usually don’t want your salad dressing making your salad soggy for hours. Or your olives leaking juice into your strawberries. It’s handy to be able to have multiple ingredients and foods in one container for easy portability. I also like that the containers are super clear. I know it’s silly but it really bugs me when I have to take a container out of the fridge and open it to see what’s inside. If you’re like us and tend to eat a lot of red pasta sauces or tomato soup you know that your containers eventually fall to turning that orange-red hue. I like that Rubbermaid BRILLIANCE is stain resistant to fight against that. I also LOVE that the containers feature vents. You can keep the lid on while your lunch microwaves without fear of anything exploding or splattering everywhere. They’re also dishwasher safe. That’s great for me as doing dishes by hand is certainly not my favorite chore. Overall, I really do like the Rubbermaid BRILLIANCE line. I’ll likely buy more to add to my collection. They aren’t totally perfect in my eyes though. As I mentioned earlier, I thought the dressing container could be a bit larger. Then it could also be used for better dipping with salsa, nut butters, etc. I also found one of the inserts to be a bit of a pain when trying to get it lined up inside perfectly. 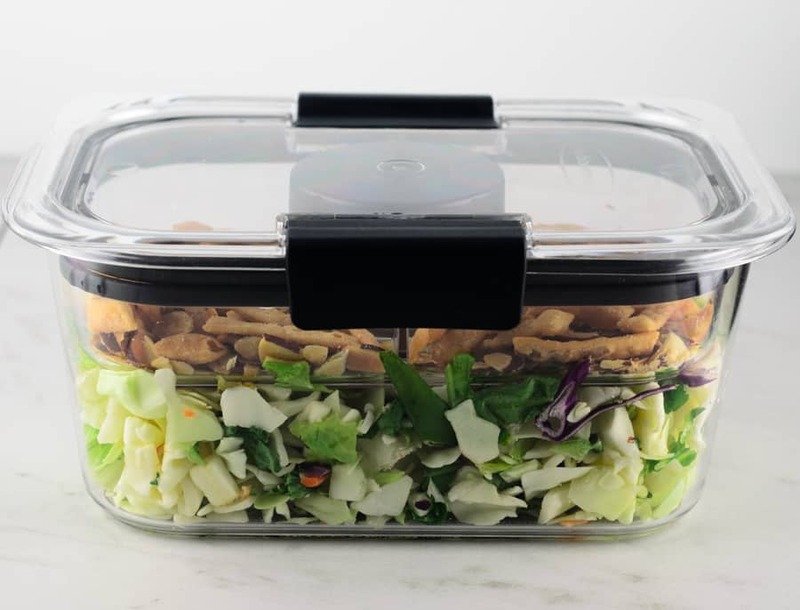 Is The Rubbermaid BRILLIANCE Salad & Snack Set Worth It? Yes! If you’re often on the go and need to take food and snacks with you, yes. Or if you’re like me and need ready-to-go meals even at home this salad & snack set is definitely worth it. This giveaway has now ended. Congrats to our winner, Azeem. 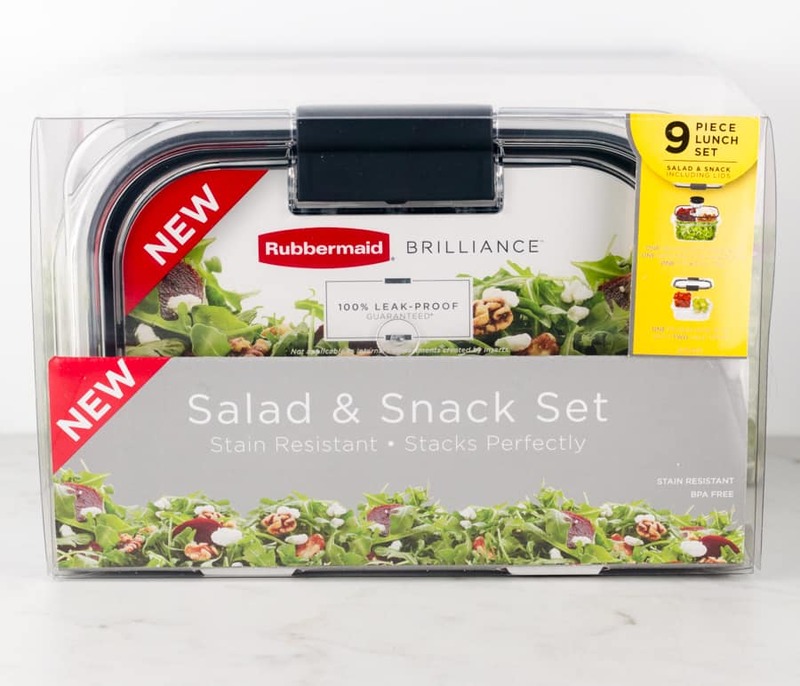 Rubbermaid/SheSpeaks is being kind enough to sponsor a giveaway where one Smart Savvy Living reader will win one Rubbermaid BRILLIANCE Snack & Salad Set! I carry a lot of salads, fruits and vegetables. I pack a lot of lunches for on the go.